enclosure-sheets are conceived as load-bearing and stiffing parts, but can be dismantled all together without the printer falling apart. all parts are designed in a way to make adjustings easy and the components inside accessible. To design the DICE was an unexpected experience and I had a lot of fun. The permanent challenge to get every detail perfect and to reach a valuable compromise in every aspect, still with the priorities in mind, was thrilling. On one hand, I had to make every part and every space as small as possible to reach the maximum buildvolume. On the other hand, things need to be convenient and accessible for maintenance and construction. On top of that, it should stay simple and with a clean design. To reach all this, I did a vast number of designs for every part and sometimes started with a finished part all over again, when another part comes into play. I had a big advantage in using my existing 3D-printers. Its one thing to design a part in a CAD-software, but it is the complete other side to hold this part in hands and try if it works. In my mind, the most challenging part to design was the printhead / X-carriage. The size of the carriage had a big impact on the later buildvolume. Every millimeter saved at the carriage was gained in more buildvolume immediately. I managed to design the whole printhead (including the 2 coolingfans and the linear-carriage) so compact, that the whole assembly isn't greater than 42mm x 56,6mm. A future upgrade would be a smaller hotend, which is the limiting factor right now. 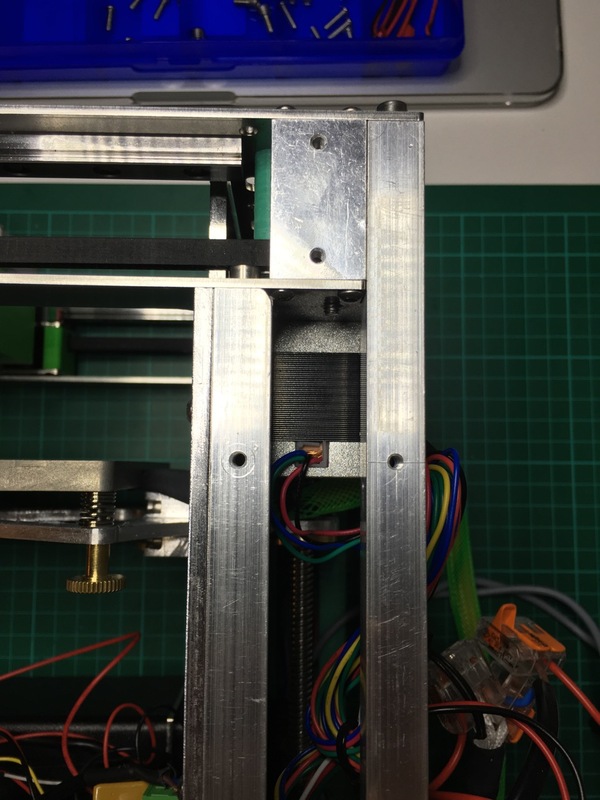 With this compact printhead, the desired buildvolume of 8x8x8cm was reached. Just when in need for print-cooling, like for printing e.g. PLA or PETG, I have to pass on 5mm buildvolume in Y-axis. The previous planned coolingfan with his 30mm-formfactor didn't make sufficient cooling and had to move for a more powerfull, but bigger fan with 35mm formfactor. If not in need for print-cooling, a fast and simple change brings back the full buildvolume. Bigger: "3510 radial blower fan"
The remaining measures of the DICE were much easier to handle. They come from existing parts and if the part is moving, I added a "generous" 1mm gap to avoid grinding. Simply said: I worked myself from the outside in. 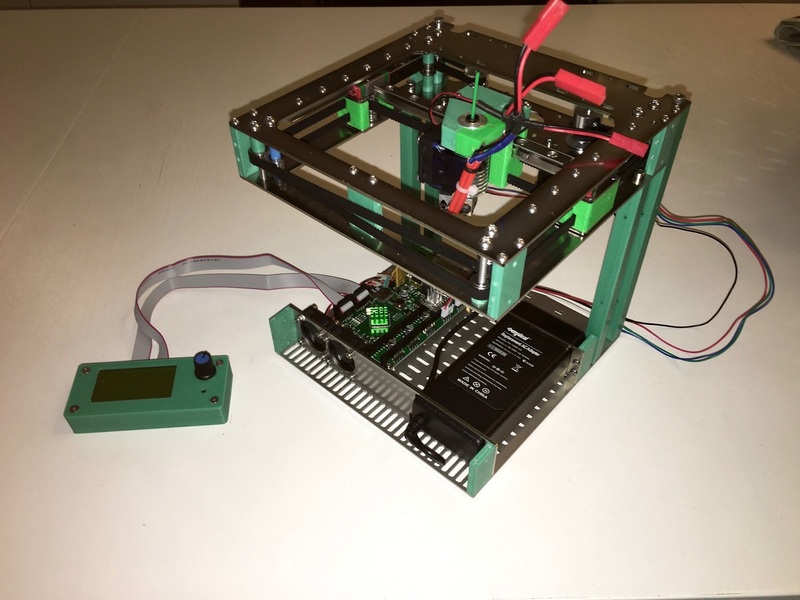 The motor of the z-axis is a shorter NEMA17 with 34mm length, with 2mm sheet on each side. Without a recess for the motor-body, no smaller distance is possible. The smallest possible assembly of one Y-carriage with flange-bearings is exactly 33mm (I tried this several times) and allows for 1mm gap for the movement with the 2mm sheet on each side. I even use the smallest possible flange-bearings. The limiting part with this is the GT2 belt. The belt is 6mm wide and two MF104ZZ-flange-bearings have a runningsurface of merely 6,4mm. With the 38mm top plain given, I made it symetrically and used the same 38mm height for the electronic compartment at the bottom. I needed to find a power supply that fits inside and is able to deliver up to 60W (so I need 90W because rule of thumb: don't use a powersupply at 80% or more of it's size). All popular affordable industrial power supplies in the needed powersize had too much design height. And all racking controllerboards, like RAMPS or RADDS are oversized, too. The GT2560 and the AZSMZ-mini have been shortlisted for mounting. Short before, I had the occasion to try out a Smoothieboard and because of this the decision was easy: I picked the smoothieware-compatible 32-bit-board AZSMZ-Mini. Who once experienced smoothieware with it's ease of use and drag'n drop functionality, knows what's good and will never change back to repetier or marlin. I put all stepperdrivers on the thick sheet right beside the controller-board. Because of its size, the 4mm thick sheet is an impressive heatsink. This two 38mm high, horizontly plains leave exatly 124mm room for vertical movement of the z-axis. Deducting a carriage-length of 29mm of the linear-carriage (MGN09CZ0M, Hiwin), I ended with 95mm possible stroke. 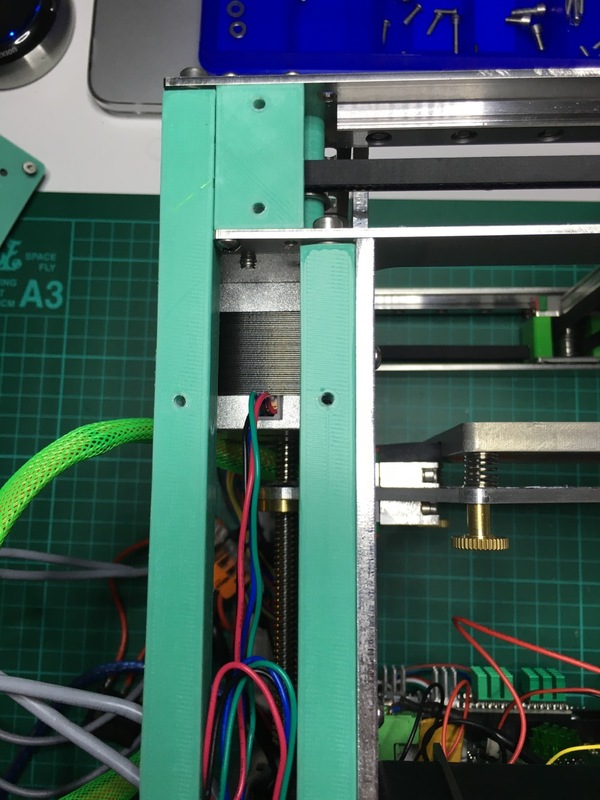 One need to consider, there is additional room needed for the printbead-adjustment and depending on the mounted nozzle, there are even some more millimeters needed. The planned printheight of 80mm left enough room to design the adjustment for the printbed generously. Additionally, I could lower the hotend a bit more, to get it more "inside" of the printer itself. The back of the DICE is exactly 51mm thick. This is the exact size the mounted NEMA17 need to fit in, not more. The NEMA17 in this picture represent a good size comparison for the size of the DICE. Remarkable is, that all mounted steppermotors are mounted in one plain and are located right beside each other. Even the extudermotor is mounted inside and only peaks outside with its shaft. On the outside, I mounted the most compact Extruder I know about. The author of this design did respond to my needs and made some changes on his design for me. That's why I could mount the best possible design. The extruder is a printed one with an MK8-gear and made for 1,75mm filament. This extruder is used on all my 3D-printers and I am very pleased with it. Super simple, super cheap to make and super reliable. If dismounting all of the cover panels, the inner frame is still able to hold everything in place. This makes any maintenance or adjustment very easy, even in this tiny printer every part stays reachable. While building the DICE, I printed the custom parts to check if everything fits together. The same parts could also be made out of aluminium, which I did to get an even more quality build. This video shows one of the first testruns that I made a video of. At first, I used RAPS128-stepperdrivers, but they are not silent enough for me. In the video, the XY-plain is set on top of 3 big expanded-plastic parts and therefore acustically decoupled from everything else. Nevertheless, even with 128-µstepping, the motors made too much noise. In the following video you will see the movement of the X- and Y-axis with 500mm/s speed. Because of the native 128-µstepping of the RAPS128-stepperdrivers in combination with my 1.8° steppermotors, this is the topspeed I can reach, even with the powerfull 32-bit controllerboard. This test did perform so well, that I started recording midprint. You can observe printing infill and at the first toplayer there is a little underextrusion. That is because of a low setting at "bridge-low" of 0.8 - insufficient for this high speed. But the following layers are printed immediately better again, a sign that the maximum isn't reached yet. The DICE starts at 500mm/s and raises the speed by 100mm/s every round. You can hear clearly, that after the third round (800mm/s) no further increase in speed happens. The most important part: printing! The DICE is capable of this, too :D I observed, that higher acceleration and the high setting of junction deviation (this is more or less like the jerk in repetier and marlin) are resulting in way better printresults. Blobs and round corners are virtually non-existant. The edges of toplayers are absolutely flat. Of course, with tweaking the coasting-setting in S3D or the "advanced-faktor" in repetier firmware, it is possible to reach similar results. But without appearing flaws at all, it is easier to get better printresults. I was expecting the DICE to print well, but that these high setting would affect the print in such a positive way blew my mind. At settings with lower layerheights, this is even more visible. I will investigate this at a later point and will do an additional posting about my findings.